The "Ennedi Massif: Natural and Cultural Landscape" is an eroded mountain massif in the Sahara desert, containing numerous rock paintings and archaeological sites. The sandstone plateau was sculpted by water and wind erosion, leading to scenically impressive features such as formidable rock arches. Though lying deep in the desert, the area sees regular rain. This results in a varied flora and fauna, and notably in the surviving Nile crocodiles in the permanent pocket of water called Guelta Archei. It became a refuge also for humans, who left rock art there. Nomadic pastoralists are still visiting. 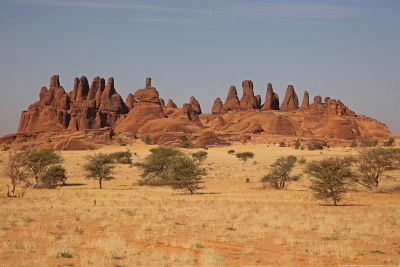 As "Massif de l'Ennedi : paysage naturel et culturel"
Reduced from broader TWHS: The property has been reduced during the process twice, the last time excluding the northern part (due to an oil exploration concession?) which could be a future extension.